Vivint Smart Home Arena, the home venue of the Utah Jazz, is the hub for major sports and entertainment events in Salt Lake City. But the early 1990s-era building was starting to show its age by 2017 — not only in its structure, but also how it was communicating with guests. While the seating bowl areas had been upgraded with state-of-the-art fan-facing LED screens and other amenities, much of the communications in the concourse were still paper-based, with sponsors having to be satisfied with messaging that would remain in place for entire league seasons. 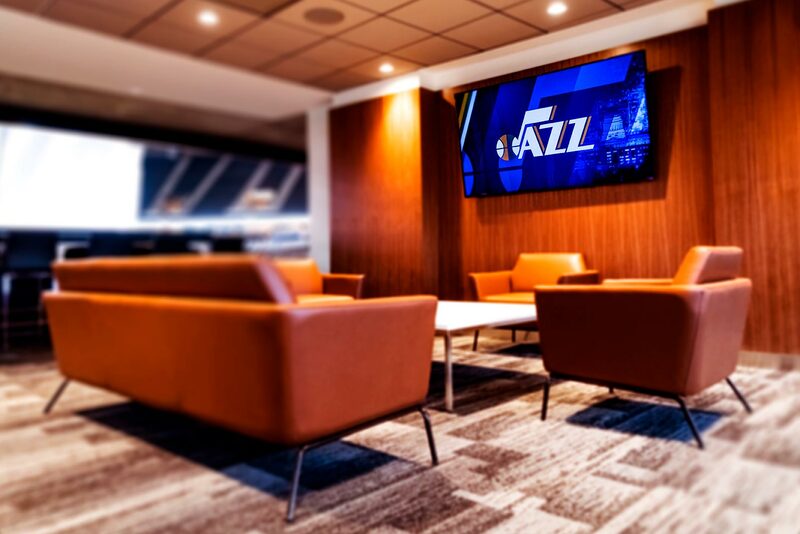 A basic digital signage system was under-performing for Utah Jazz marketers. A massive digital signage upgrade was included in a $125-million facility upgrade carried out in the summer of 2017, between NBA seasons, at the arena. 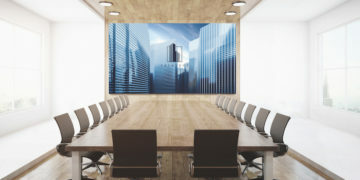 In a rapid deployment plan executed by RevelTV, more than 600 Samsung displays — including 27 videowalls — using embedded System-on-Chip (SoC) media players and running Samsung’s Tizen operating system, were added around all the public areas of the building. Team owners now have a system capable of instant, highly targeted messaging that can change as often as needed and only needs power and a network. Revenue is being generated and costs recovered from the comprehensive network through targeted, event-specific advertising messages sold on a display-based advertising network. Branding and messaging are digitally adjusted by event, and the ownership group’s marketers and communicators are using the screens for everything from safety messaging to promoting upcoming concerts and attractions — all in ways not previously possible. The Jazz were founded in 1974 as the 18th team in the National Basketball Association (NBA). The team relocated from New Orleans to Salt Lake City in 1979. The team has one of the best overall records in the league dating back three decades. Off the court, the team is involved in a multitude of charitable activities and operates the Junior Jazz program, the largest and longest-running youth basketball league in the NBA. As a community gathering place, Vivint Smart Home Arena hosts more than 100 events annually and sees about 1.8 million guests. While the Utah Jazz are the prime tenants, year to year the arena sees everything from rock and pop concerts to monster truck rallies and ice skating shows. Built in 1991, the arena was home to figure skating during the 2002 Olympic Winter Games. Through the years, the ownership group Larry H. Miller Sports & Entertainment had done a handful of modest upgrades to the building, including a set of spectacular center-hung LED replay and scoreboard screens in the seating bowl. But the building was starting to fall behind other venues in terms of the game-day experience for fans — everything from the quality of seating and VIP amenities to how messaging was done to direct people around the facility and influence concession stand sales. At the conclusion of the 2016-17 season, the doors were closed and the arena started a massive $125 million refresh program that needed to be completed in 129 days — ready to open again by that September. More than 2,000 workers were on the job, doing everything from demolishing concrete walls, removing all the old hard plastic seats and building new dining, club and social spaces. Steve Starks, president of Larry H. Miller Sports & Entertainment, said the goal was to reopen with a reimagined, fan-focused venue that delighted guests and enhanced the amenities. The group also wanted a reboot of the aging technology that is central to game and event day experiences — something that was ultra-reliable, cost-efficient and dynamic, as well as easily managed and future-proofed. Samsung and local solutions provider RevelTV were engaged by Larry H. Miller Sports & Entertainment to develop and deliver a complete revamp of the concourse area digital signage, as well as an IPTV solution to replace the old, conventional television solution used to deliver TV and custom programming to the area’s upgraded suites and premium guest areas. 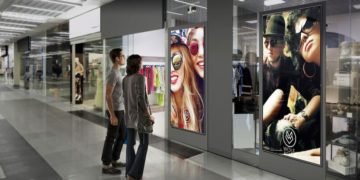 RevelTV installed and activated 607 Samsung digital displays, using embedded System-on-Chip (SoC) media players and running Samsung’s Tizen operating system, in all the public areas of the refreshed building. 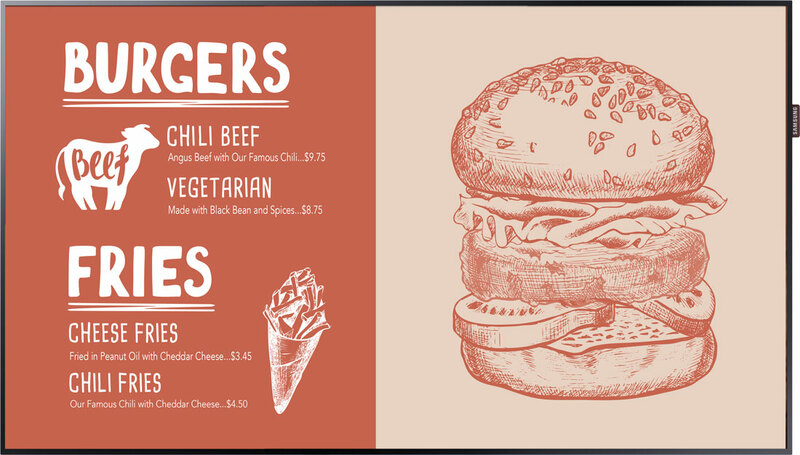 Digital Menu Board displays sell concession offers, and promotional screens do everything from marketing brands, products and services to making event-goers aware of upcoming games, concerts and special attractions. There are screens in landscape and portrait mode around the public area, from 49-in. to 82-in., as well as 24 tablets in club seating areas and 45 10-in. displays. There are also 27 distinct videowalls — with 3×1, 4×1, 4×2 and 2×2 configurations — around the common entry areas and concourse. At each concession stand, one or more displays are used for menus along with others for showing live game feeds, upcoming events, other fan information and sponsorship ads. There are also displays for each premium suite and multiple displays in each premium club space. The conventional digital signage is managed by the company’s own Channel Valet digital signage application, which integrates and uses multiple digital signage platforms, selecting software based on use-case and capabilities. The Jazz uses Channel Valet to do any content work with the system not done directly by RevelTV. Skeptical owner group facilities and IT executives, worried about the reliability and signal quality of delivering programming over the building’s network, had Samsung do technical trials at RevelTV’s offices — effectively trying to “break” the setup — before signing off. Run your content 24/7 with an embedded System-on-Chip media player platform. 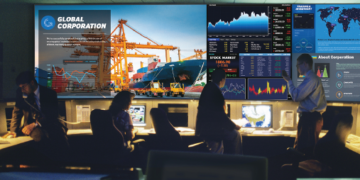 A stunning 4K UHD all-in-one digital signage solution featuring 24/7 operating power, IP5X-certified dust protection and Beacon management technology. The full network was on and ready to go in time for the new season, as well as a full concert and event schedule, in fall 2017. Vivint Smart Home Arena now has a system that is dynamic and flexible for sponsor and advertising needs, trims costs, minimizes outages and elevates the fan experience. Jamie Galileo, senior VP of facilities for Larry H. Miller Sports & Entertainment, remembered the old days of posters and even 19-in. tube TVs, and noted the current state with videowalls, 82-in. 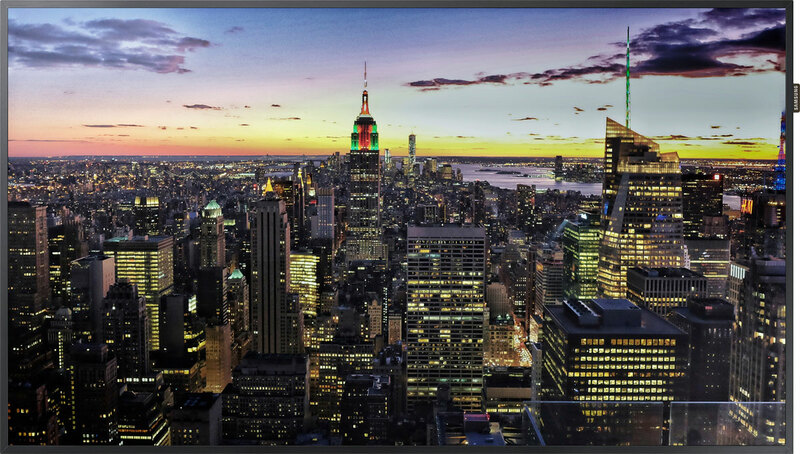 flat HD displays and content management tools that can change the messaging, look and feel as often as needed. Vander Linden said the owner group is very pleased with the network and content management tools in place, because they allow a lot of messaging to be developed, distributed and triggered quickly and easily. Efficiency reduces resource requirements, reasoned Fitzpatrick, but so does system reliability. By shifting away from conventional digital signage solutions that involve separate, dedicated media players at each screen, he said, they were able to remove about 4,000 potential failure points. Typical signage installations have PCs or media players with internal hard disk drives, power supplies, video signal cables and networking cables — all subject to damage and failure. Samsung’s smart screens have embedded, solid-state players, and the only cable needed is the one powering the screen. Samsung’s Stock said using smart screens for the IPTV solution also introduced massive cost savings, noting that removing the need for a specialty $1,500 IPTV device and $300 in licensed software at each screen — when calculated across the whole area — reduced capital costs by roughly $1 million. In the span of a long summer break, the Salt Lake City arena went from aging and tired to one of the top venues in North American professional sports — serving dynamic, energetic digital signage content on game days, and future-proofed for the steady advance of technology.